Yum! How would you adapt for pressure cooker, i.e. instant pot? I’m thinking you could do the first part in saute mode, but I’m not sure about cooking time in pressure mode. Thanks for any thoughts you have! This soup is Fantastic! Even my kids devoured it…that’s a huge win win!! Absolute comfort in a bowl….thank you for the recipe! Easy and delicious fall crock pot dinner! What would I need to change if I wanted to do this stove top with a cast iron? I just used a regular soup pot and simmered in low until everything was cooked through. Maybe an hour or so. I see that it serves 8. Can you please tell me how big a serving size that translates into? I am guessing somewhere between 1 1/2 — 2 cups. I’m trying to avoid having to divvy into 8 bowls to figure this out. I’m ytacking my food intake for health reasons. anyone know how to alter this to use in the instapot? i am a newbie with the instapot and am trying to decluter, therefore giving away my crockpot and using the instapot for all types of recipes like this. thanks!! I have had this bookmarked forever and made it last weekend. Lots of chopping but so worth it. This was beyond yummy! I meant to add I just cooked in a regular pot on the stove. To impatient for the crockpot. It worked just fine. I honestly never comment on recipe posts but I just had to share how amazing this soup was! I made it for my family for dinner tonight and it was a total hit! I absolutely loved the texture, especially the kale added in at the end. And the creamy emulsion of the olive oil… honestly probably the best lentil soup I have ever had. I will be making this over and over again! Thank you! Hi – how do you cook this in a Dutch oven if you don’t have a crock pot? Thanks! Hi Stephanie! You should be able to just follow the directions as-is, but simmer for about an hour before blending to soften everything up. 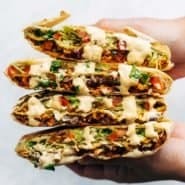 What size crockpot do you recommend for this recipe? I want to make sure the one I am using is big enough. As a busy mom of 4, I am always looking for AMAZING crockpot meals. This one is on my weekly dinner list during the cool weather months. And I throw it in occasionally year-round. It is to die for. The kids love it! 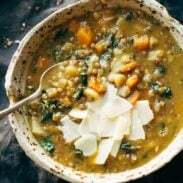 This is a wonderful lentil soup, and so nice to make it in the AM and then just open the pot and enjoy at dinner time:-) I left out the squash and kale because my crockpot was full already. But I added broccoli stalks (chopped) because I had them on hand, and used a leek instead of onion. I also saute’d all the veggies (leek, garlic, carrots, broccoli stalks, and potatoes) before adding to the pot. It took longer but gave it an extra dose of flavor. 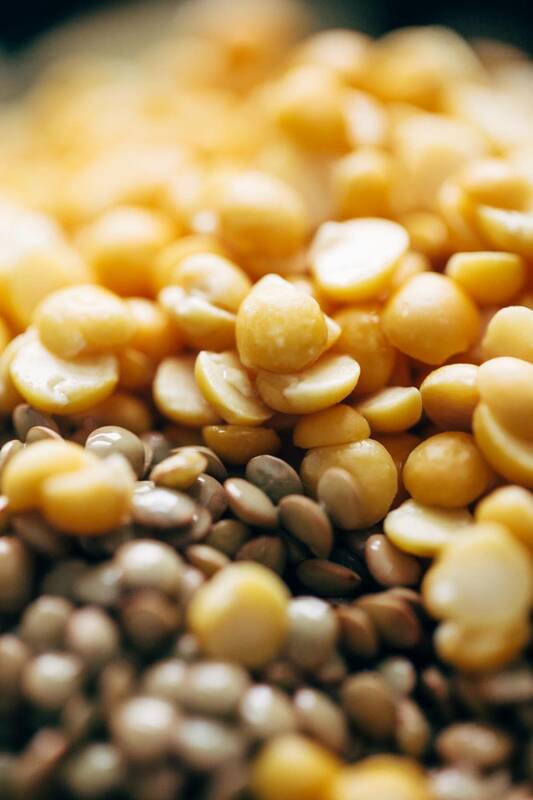 Can you use red/orange lentils? Hi! Wanting to make this, sounds delicious. For the olive oil, I only have regular olive oil. Should I buy rosemary olive oil. Or u said infused olive oil. Can I just add rosemary to my olive oil? Sorry just not sure if it will taste right without flavored/infused olive oil. Thanks!!!! just made the detox soup and it’s delish! I left out the onions and garlic since I have a sensitivity – leaving them out took nothing away from it. it’s a really good soup!! The recipe is awesome. My only complaint is I have had my crock pot on for 9 hours and the lentils and split peas are still hard. Super disappointed. Should I have soaked the lentils and peas? The recipe doesn’t say to do so. How would you adjust for the Instant Pot? Not sure what I did differently but this soup did not turn out as good as I hoped. The first night it was good tasting but the texture was a little bit thicker than I would have liked. It did not make very appetizing leftovers for me. It’s gotten really thick and has turned this brownish/greenish color. Still tastes okay… but has no visual appeal. 😬I was so sad because it made a ton. I put some in the freezer. Any ideas? Maybe I should have used more broth? Maybe cooked it too long? This is a bautiful recipe!! 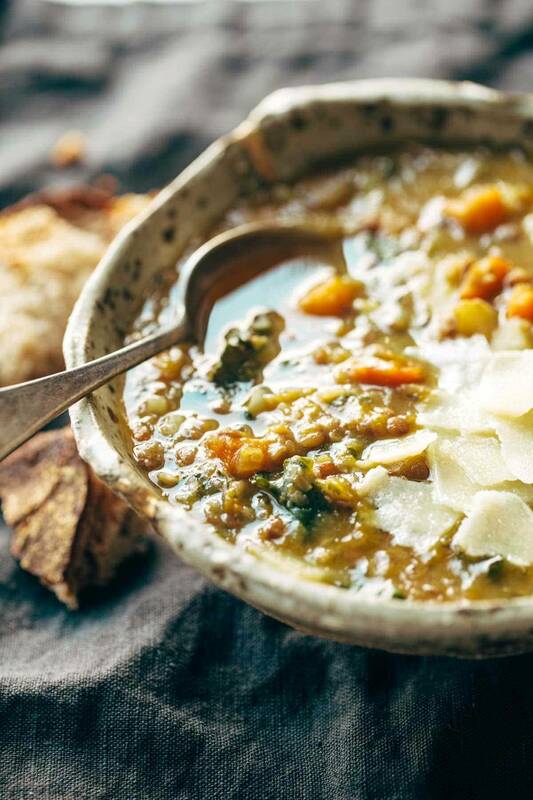 I’ve been making soups for most of my 65 years and I like your version of a good healthy lentil soup and using my favorite herb mixture of herbs de Provence. Also love the idea that you can either use sweet potatoes or squash. You did a wonderful job with this recipe. Thank you. I made this in my Instant Pot. I heated the broth on “Saute”, added the other ingredients, except salt, and brought it to a boil. Then I turned the Instant Pot off, put the lid on and cooked on “manual” at high pressure for 10 min. I let it natural release for 10 min, then did a quick release. I pureed the 4 cups with the oil, added that back in, and added the kale and salt. I let it sit about 10 minutes before serving with red wine vinegar or lemon juice per each one’s preference. A few slivers of parmesan were yummy, too! Thanks for the recipe! If I want to cut the recipe in half, how long should I leave in the crock pot?